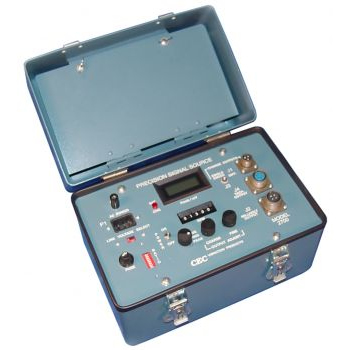 Designed to calibrate instrumentation systems, the portable CEC 2700 Precision Signal Source provides accurate signals that simulate charge or millivolt outputs from piezoelectric accelerometers or other motional transducers. This portable instrument is easy to set-up and use. Unlike other fixed-setting calibrators, the CEC 2700 lets you calibrate systems at specific test or operating conditions because you can adjust the frequency and output level to any value within their range. Designed to calibrate instrumentation systems, the portable CEC 2700 Precision Signal Source provides accurate signals that simulate charge or millivolt outputs from piezoelectric accelerometers or other motional transducers. This portable instrument is easy to set-up and use.